ST. LOUIS, MO–(Marketwire – Oct 26, 2011) – Not all aging horses are alike when it comes to their nutritional needs and dietary requirements. With an estimated 700,000 senior horses living in the United States today, senior horse nutrition is of big concern to many horse owners. Consideration of varying degrees of activity, dental and digestion performance in senior horses has led Purina to develop its new Equine Senior® Active Healthy Edge® horse feed. Equine Senior® Active Healthy Edge® horse feed now joins the original Equine Senior® horse feed formula as one of two trusted nutritional choices for feeding aging horses. While the original Purina® Equine Senior® horse feed remains the industry gold standard in senior horse health and nutrition, Purina is proud to announce the addition of new Equine Senior® Active Healthy Edge® horse feed to their family of feed products. Key findings suggest that the healthy aging horse that continues to stay active may benefit from a diet formulated with more calories from fat and a different balance of nutrients. Because not all senior horses require a complete feed with roughage built in, Purina has introduced a more calorically dense formulation specifically designed for the active, aging horse that still has the ability to effectively chew and digest forage. 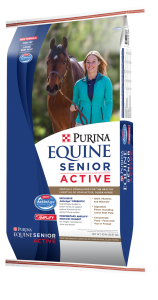 Purina® Equine Senior® Active Healthy Edge® horse feed is a pelleted feed with a high fat and fiber, controlled starch and sugar formula that delivers all the vitamins and minerals the aging horse needs. The new Equine Senior® Active Healthy Edge® feed is formulated for the aging horse that can still consume and digest forage and benefit from the calorically-dense formula to support their active lifestyle. The original Purina® Equine Senior® horse feed is formulated for horses with compromised dentition and/or digestion and has the proper levels of roughage and fiber built in to meet the needs of these horses. For horses with good dental and digestive health — to be fed with hay or pasture. Includes the Purina® Amplify® Nugget, a patented, high fat, extruded particle that contains a proprietary blend of vegetable oils, flax seed and stabilized rice bran for an optimal fatty acid profile. Supplies more calories from fat, less from sugar — provides a diet lower in nonstructural carbohydrates that may help aging horses with difficulty managing blood sugar levels. Formulated with a proprietary amino acid balance. Contains a special blend of fiber sources including beet pulp to support normal digestive function. Manufactured with the FeedGuard® Nutrition System, one of the industry’s most innovative and exacting quality assurance programs. To receive a trial offer and to determine which Purina® Equine Senior® horse feed is right for your older horse, take the quiz at www.activestill.com. For additional information regarding Equine Senior® horse feed and the entire line of Purina horse feeds, visit horse.purinamills.com. This entry was posted on Friday, October 31st, 2014 at 9:07 am	and is filed under News & Updates. You can follow any responses to this entry through the RSS 2.0 feed. Both comments and pings are currently closed.